The "Bergepanzer Tiger" was issued to its unit with a complete set of "Feifel" air filters. Photos of the unit show that they apparently didn't use these filters; most of their Tigers didn't come with the filters in any case. Although the filters were not installed on the rear wall, there were 8 welded mounting blocks for them, 4 on each side. This photo shows them on the left side of a museum Tiger. They can be seen in photos of the "Bergepanzer" itself. 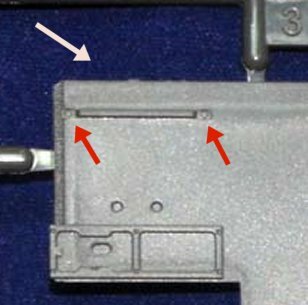 Here, you can see exactly how the blocks were welded to the top edge of the rear wall. 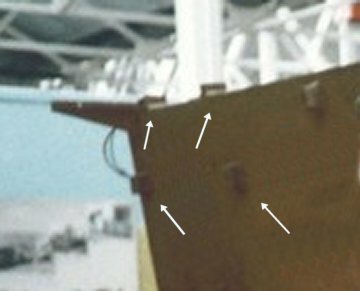 At the right of the photo there is an S-mine support arm; note how close it is to the Feifel blocks. 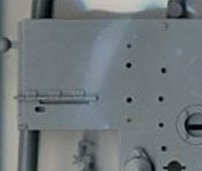 The best model kits of this vehicle do not provide these welded blocks on the rear hull wall. This photo shows the rear wall of the Rye Field kit; the top blocks are missing entirely, and there is an inaccurate raised strip instead of the lower two blocks. Dragon's rear wall simply doesn't have anything at all here.